(Newser) – The three California processing plants linked to the salmonella outbreak that has sickened nearly 300 people in 18 states will be allowed to stay open, the AP reports. 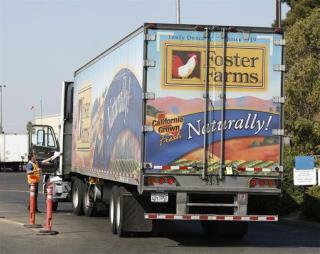 USDA inspectors will conduct "intensified samplings" at the Foster Farms facilities for the next three months, but they're satisfied for now that the company has fixed its problems. The feds aren't recalling any chicken, either. They say the meat safe to eat as long as it's cooked to 165 degrees. "Hey teabaggers, come and get some FREE lunch"
Maybe if all the illegal aliens working in these plants would learn to take a shower maybe there wouldn't be a problem? Just wait until the Trans Pacific Partnership agreement is completed. This will be the "good old days."